Laying there with the warm afternoon sun hitting me and the sound of waves crashing onto the shore, I did not want to open an eye. It is very easy to become lazy in Bermuda. I could spend hours staring out at the turquoise water, pink sands, lava rock formations, and bright blue skies. But it was our last full day on the island and I wanted an adventure! So, we peeled ourselves off of our beach chairs and were off! Okay, I’ll admit it, I’m slightly obsessed with caves! I’m not sure why, maybe it’s the mystery that they hold. A deep dark location that not many others have explored. Maybe it’s the not knowing what is around the next bend that excites me. 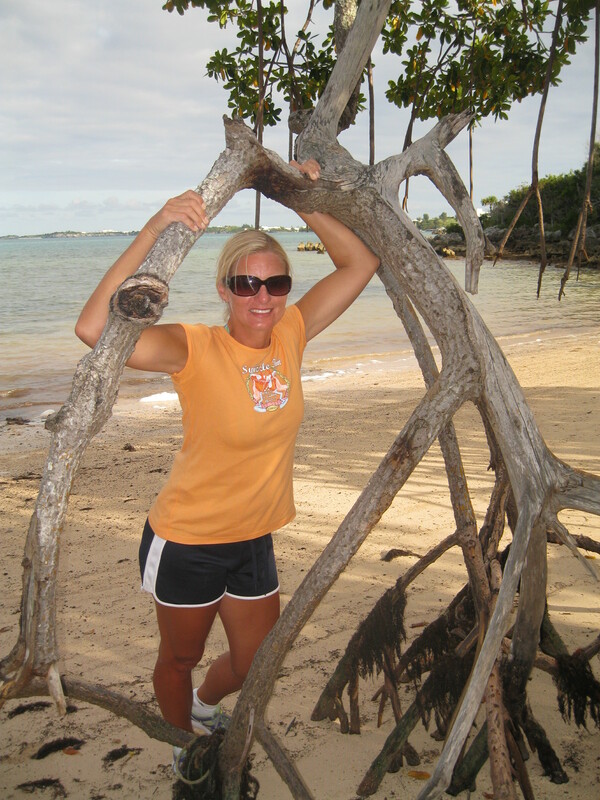 Whatever the reason I love to find caves to explore, so when I saw that there were some in Bermuda I was ready to go! My husband and I hoped in a taxi and took it to Tom Moore’s Jungle. The jungle was right on the water, a quiet harbor view. We began to follow a well maintained path into the woods passing just a few people, a man walking his dog and another couple enjoying the warm late afternoon. Soon we came to a small pool of blue water framed by rocks and crevices on one side. I’m guessing this was Blue Hole. It was a beautiful and peaceful area. We spent some time here looking at fish in the crystal clear waters and then were on our way. There were caves to discover! Back on the main path we soon spotted a barely visible trail heading off to the right deep into the thick undergrowth. My husband thought that it may just be a herd path but I was pretty sure that this was it, our route to a cave. 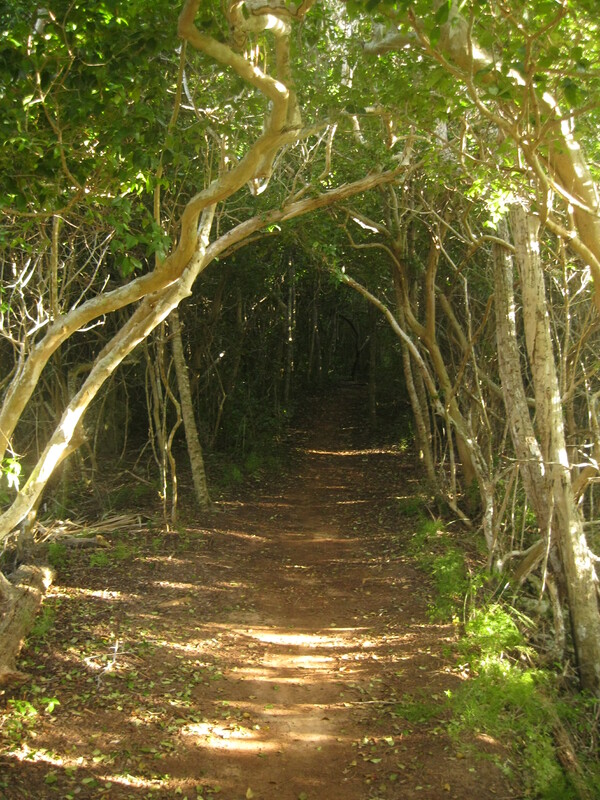 We started on the path and were soon ducking low to avoid the tangle of vines and tree branches that were overhead. The vegetation quickly enclosed us and we could not see more than 10 feet in front or behind us. Branches scraped at our legs and arms and thick fronds hit our faces, yet we continued. A few times we made a wrong turn, losing the near invisible path. Finally we came to a pile of rocks that seemed to lead down a steep hill. We peered over the mound and there it was, our hidden cave! We left our bags on top of the rocks and carefully picked our way down the sharp jagged lava rocks. One slip here would result in some major cuts and scrapes! The vegetation still grew thick, blocking most of our view. After a few minutes of making our way down we arrived at the cave’s opening. We peered in through the murkiness and were greeted with a gorgeous view. It was a grotto! 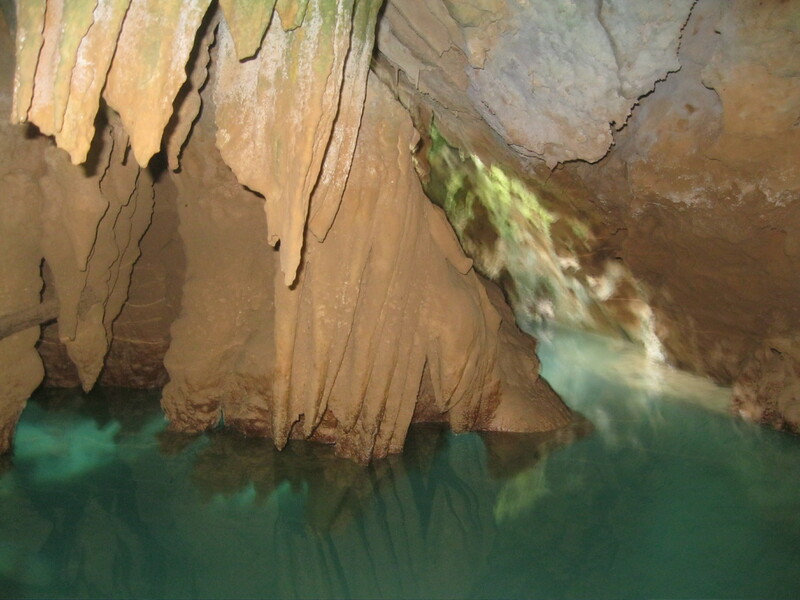 Bright blue water filled the cave and stalactites and stalagmites clung to the walls. A beam of sunlight pierced the darkness and made it’s way into the cave. The water was so clear that we had to throw a rock into the water to see where it began. It was deep! “We’ve got to swim here!”, my husband cried. I agreed. 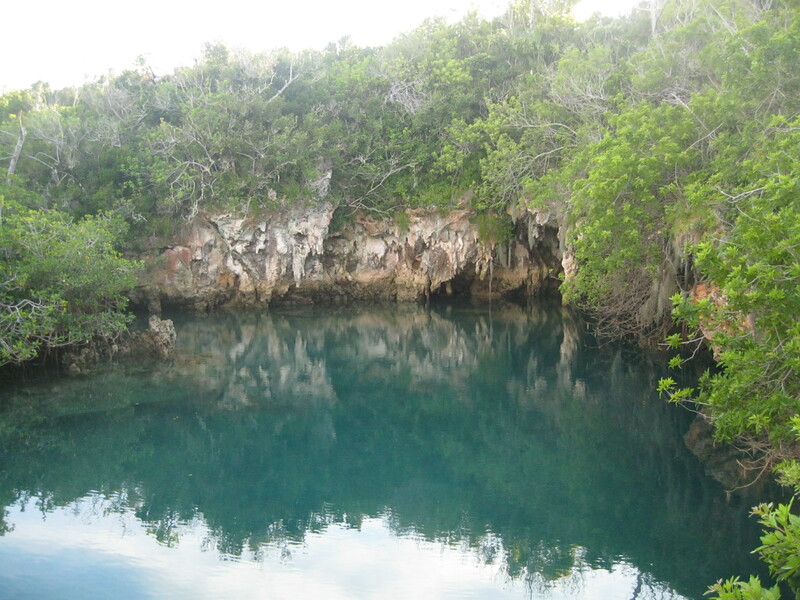 How often do you get to swim in a grotto filled with crystal clear water deep in the jungles of an island? We slipped into the warm water and swam towards the other side. My husband reached it first and exclaimed how cold the water was there. We looked down and saw that it was deep here, too deep to see the bottom. The water here was coming from deep inside the earth! I got out of the water, but my husband decided to swim further into the cave. This required swimming underwater through a short tunnel of stalactites and stalagmites right over the cold water coming from the depths. This freaked me out a bit, so I passed. My husband made it without issue and went on to explore the other side of the cave. I grabbed my camera and began taking pictures. The site was truly magical. The sun was beginning to set and tree frogs began to peep all around us providing a soundtrack to our adventure. I looked up and all I could see was the thick canopy of the jungle. We were truly alone, hidden from the outside world. All too soon it was time to leave. We climbed the steep rocks out of the cave and fought our way back through the tangle of undergrowth until we reached the main path. We explored a few more caves, but none lived up to our first cave. The sun was setting quickly so we made our way back to the entrance to catch a cab back to our hotel. We hopped in tired and happy and turned toward the ocean just in time to see the bright orange sun dip into the water. A magical ending to a magical adventure! Bermuda was now deep in our souls! Oh W O W! I’ve only done a little bit of caving. It doesn’t include dipping in either. Your adventure is obviously way better than mine. By the way, who doesn’t like the mystery of caves? I think everyone gets magnetized by any caves that exist. I need to find this cave! I am a self-proclaimed expert when it comes to Tom Moore’s Jungle and I have yet to find this hidden gem! If you go on geocaching.com you can find the cave. Upload it to a gps and it will bring you right to it! I’ve heard about geocahing, but don’t know much about it. What exactly would I be typing in to find the exact location of this particular cave? Like I said, I am very familiar with Tom Moores and many of the caves it has, but I do not know where to find this particular one. Do you recall if the cave is before below or above the small rock climb; or if it is before or after the larger cave swim. I saw that you had been in that more popular cave for a swim as well. 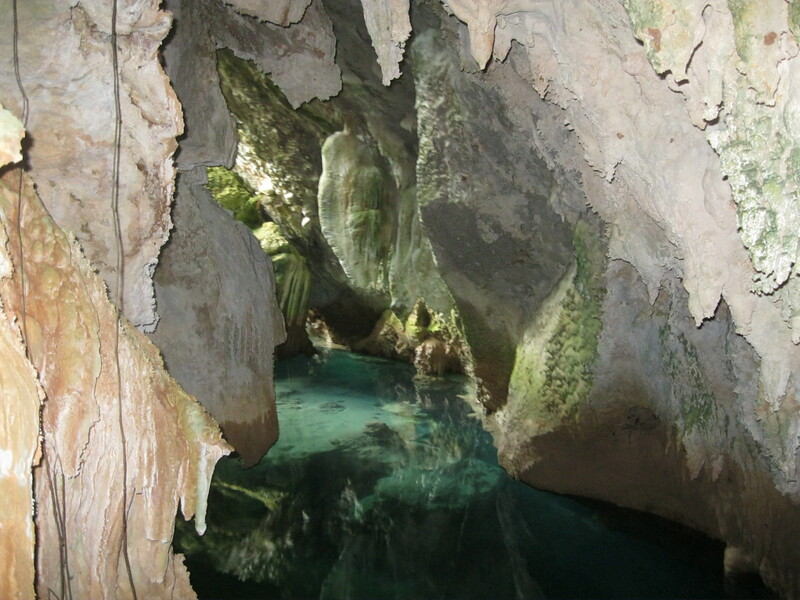 There is also an underwater tunnel in that cave which leads you to another beautiful grotto. Go to the Geocaching site and sign in (it’s free if you don’t have an account). Then go to “play” and then “hide and seek a cache”. Once there you can select map view and type in Bermuda. The closest cache to that cave is called “Tom”. 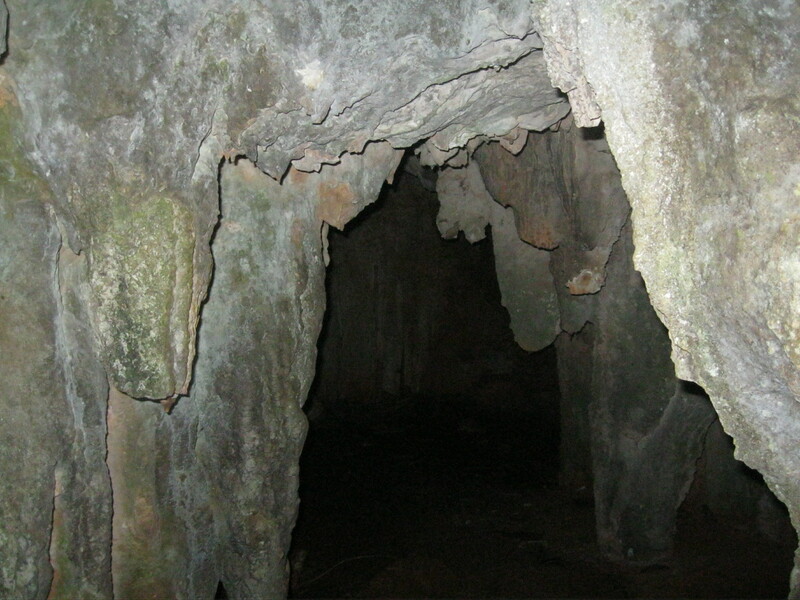 That brings you to a few other caves in the area which are neat to explore as well. You can either upload that cache to your gps or there is a geocaching app that you can use as well. I used the comments from the Tom cache to find the grotto that I talked about. It’s a herd path off of the main path. I was just looking at the comments and someone put coordinates in their comment (8/12/12 is the comment date). I think those were the coordinates I used. Hopefully this helps some. I hope you find it! It was a really neat area! Let me know. Also, what is the brochure that you are designing for? Thank you soo much for your help! I am in the process of opening an eco-excursions business and one of the stops for exploring is Tom Moore’s Jungle. More specifically, I wanted to use the pictures labeled ‘blue hole’ and ‘walking the main path’. I have many pictures of my own, but I really liked how yours turned out for these two particular sceneries. I hope you find it! You can use those pictures. That’s very exciting about opening a eco-excursions business. Tom Moore’s Jungle was our favorite on the island! Will your business just be in Bermuda? I found it yesterday! Soo completely tranquil and beautiful! I will have to send you a picture. We also found the cache a little ways over and signed our names in the log book 😉 Thank you soo much once again for all of your help! If you ever come back to Bermuda, let me know and your next tour will be on me! The brochure designer was asking for me to send the photos in their original format. Could you send the Blue Hole picture to my e-mail? That would be greatly appreciated! 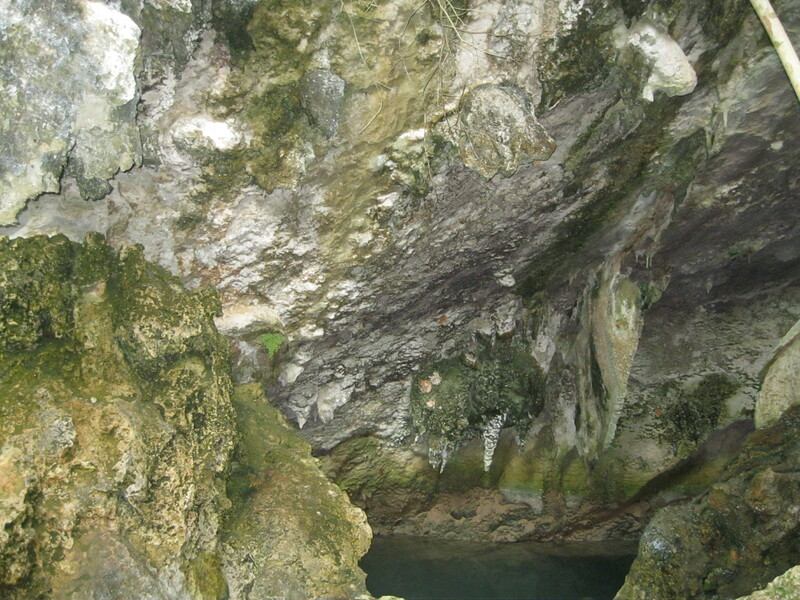 Hi Ashley, i will be going back to Bermuda this July and i want to find that grotto because we didnt find it last time, so thanks for the great description, yours is the most complete one ive found! I have a question, about how long is the underwater tunnel? Just wanted to figure out if my 15 yr old can swim it. Thanks! It’s not long at all. It’s been a few years, but from what I remember it’s a short swim. We loved it!